Despite US Core Retail Sales matching its best performance of the year in April at 0.7%, the EURO is positioned to resume its resilient move higher. The DOLLAR is faced with renewed downward pressure as markets anticipate US Core Retail Sales (m/m) to slip 0.1%. 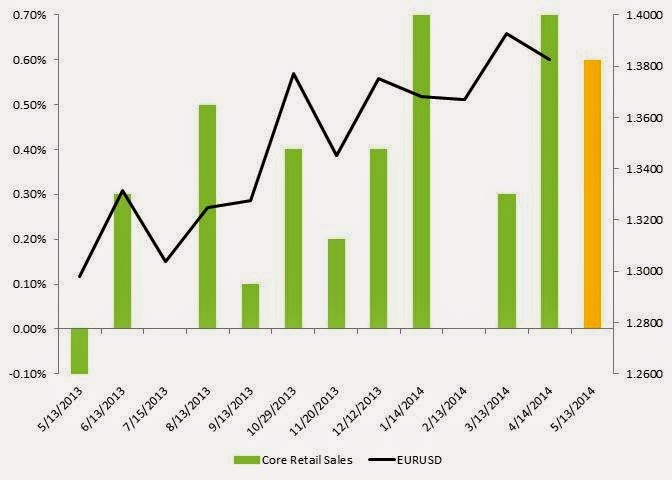 This notion is further validated by the historical correlation between US Core Retail Sales and the EURUSD. Although most technical signs point to a BEARISH USD outlook, any soft EUROZONE economic news may curb analysts’ predictions and market reactions. Technical Outlook: Initial bias to the upside for the EURO but DOLLAR strength not off the table if there are any bullish surprises from the upcoming economic events.